DML has now released a second "Premium" T-34-85 kit by making more changes to the recent release, but in doing so has made the other kit (No. 6319) more of a "kit collector's" item by offering four distinct variants in this kit. What DML has done is to add 32 more parts including the Model 1944 "Split Hatch" to its previous "Big Hatch" release, therefore permitting the modeler to make either one from this particular kit. They also now provide the flame projector for the bow machine gun mount to make the kit into an OT-34. Lastly is the "Bedspring" armor version seen late in WWII and most notably photographed in Berlin. 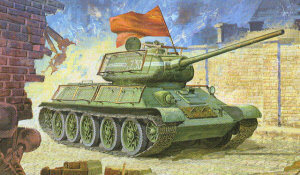 Recent Soviet archival material releases published by Russian authors show that this was not the case, as these mesh shields were actually manufactured specifically for the purpose of stopping Panzerfaust grenades from striking the tank, and therefore the term "bedspring" is just a nickname and not their actual structure. The base kit is again the T-34-85 Model 1944 (Late Production) with the single flap hatch and twin ventilators at the rear of the turret. The original T-34-85 kits came with just over 400 parts, all but one of which were in grey styrene, and setpiece tracks on sprues. The rear engine grille was a solid component and no other media came in the kit other than one length of nylon string. As with Kit 6319, this is the same kit but with some key changes. The C sprue (upper hull and gun) has been redone, with opened louver bays and places to add either styrene parts from the "H" sprue or etched brass parts. However, for some odd reason the kit comes with the original engine air exhaust decking (part B15) with the solid grille. There is a two-part etched grille on the brass fret, but the modeler still has to cut out the kit's grille to install it. Since it is solid, this will be somewhat tedious. This kit at least provides etched brass louvers for the area under the grille, so it is one step up on Kit 6319. The styrene gun barrel now is slide molded as are two new exhausts for the rear of the hull. Also included is a complete DT machine gun for the bow. The rest of the kit is virtually the original kit (not that it was a bad kit!) with the addition of the "Magic Link" tracks. These come separately bagged as "Link 1" and "Link 2," but unlike German tanks with left and right side tracks, these are easy to sort out. However, it is recommended that the idler adjustment arms (parts A6) be left loose until the tracks are ready to test fit so that the length will come out right. As always, T-34 tracks HAVE to have an even number of links so the flat and toothed links will mesh. The rest of the brass "spiffs up" the model with details on the hull and turret hatches. The "bedspring" panels are very well done, and when held up to a good light one can see they simulate an interleaved webbing of wire on the frames. A very nice Cartograf decail sheet – targeted – comes with the kit and provides markings for one of four tanks: Unidentified Unit, Berlin 1945 (4BO green with the "bedspring" armor installed); 2nd Guards Tank Corps, Eastern Prussia 1944 (4BO green); 3rd Guards Tank Corps, Prague 1945 (4BO green with white stripes); and Unidentified Unit, Eastern Front 1944 (red brown patches over 4BO green). None are given specific details except the "bedspring" variant, but some research and aftermarket transfers should cover the bases. Overall, this kit may not have been a great idea as it makes the previous Premium Edition kit superfluous except for the decal sheet.